To develop and nurture long lasting industrial relationships using high quality cost effective means while providing services when and where they are requested. Do you have a painting project? Are you looking for a contractor that you will want to use again in the future? We Paint It 4U, could be the company you are looking for. * In the last 2 years we performed industrial painting services for 24 companies, 14 of which were new customers. In meeting their maintenance needs; 7 of the 14 are already repeat relationships. * Whether your needs are for a storage tank (silo), grain elevator, or your building needs cleaning or painting; Contact Us for competitive quotes and professional workmanship. * We would appreciate the opportunity to be your commercial or industrial painting contractors. * Our 7 day work week provides for minimal downtime. 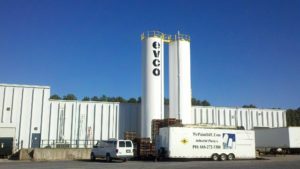 Our experienced crew; of industrial painters, has applied roof coatings, performed storage tank painting (silos) in Montgomery Alabama; between Mobile and Birmingham, and in Louisiana among other states.